We’ve seen brief glimpses of the superteam in various Legends of Tomorrow stills and footage, but now we have them all together in our best look yet at this newest version of DC’s classic heroes. The Justice Society will make their debut in the second episode of Legends’ new season, aptly titled “The Justice Society of America,” which sees the Legends travel back in time to Nazi-occupied Paris to intercept a mysterious anomaly in the timeline that threatens the very existence of the JSA. This form of the team features Commander Steel, Vixen (a former incarnation than the one that already appeared in Arrow), Dr. Mid-Nite, Stargirl, Obsidian, and Hourman, who first cropped up at the end of Legends’ first season. It’s kinda weird how everyone got the CW-patented “muted colors and dark leather” treatment except for Stargirl, isn’t it? Honestly, her retro (and comic-book-y as hell) outfit works much more for the time period. 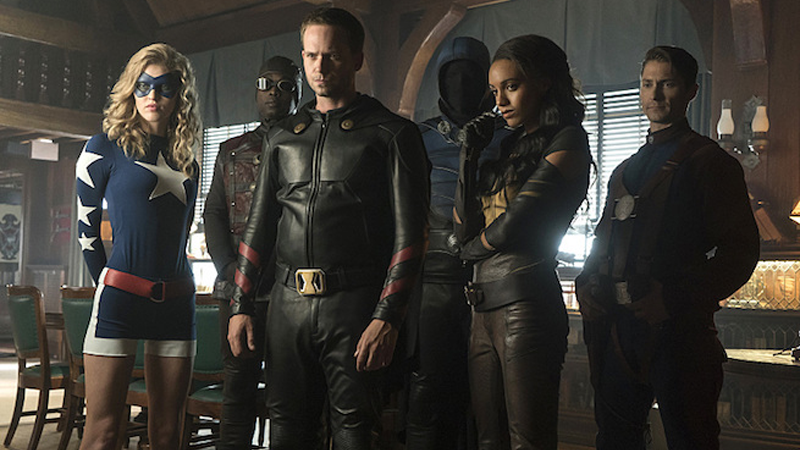 The Justice Society will make their debut on Legends of Tomorrow’s October 20 episode.